Companion planting is all about which plants grow well with others. And it is particularly important in a little vegetable garden. The idea comes from research that shows that some plants have a beneficial effect on others when planted in close proximity. Some attract beneficial insects. Marigolds attract ladybirds. And Ladybirds eat aphids, as well as the insects (Meloidogyne spp) that are the root knot nematodes. Some repeal insects, strong smelling herbs in particular. Taller growing plants can provide shade for smaller more tender plants. Some plants have root systems that can act as a growth stimulant, other can hinder seed germination. In larger commercial plantings, chemicals are often used to overcome these issues. In your little veggie patch, companion planting is a healthier method. The question is what to plant with what. The Table below is a guide to some of the more common companion plants. Cabbage family (The Brassicas) Plant them with Beetroot, Rosemary, Thyme, Lavender and Marigolds. Don’t plant them with Strawberries or Tomatoes. Corn will grow well with Beans, Peas and Zucchini. Onions and Garlic These will grow well with Beetroot, Silverbeet and Tomatoes. They do not grow well with Peas, Beans or Potatoes. Peas grow well with Beans, Corn and Carrots. They do not like Onions, Garlic or Potatoes. Potatoes – We tend to grow Potatoes by themselves. They do grow well with Marigolds, Nasturtiums, Peas and Beans. They do not like Onions,Tomatoes or Pumpkins. Pumpkin grows well with Corn, but not potatoes. Strawberries, grow well with Spinach and Lettuce, however not with Garlic or Tomatoes. 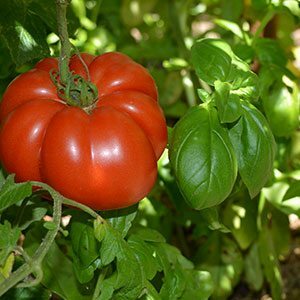 Tomatoes really do like Basil as a companion plant. They like Corn andParsley. They also will benefit from a border or marigolds. Some plants are just better off by themselves and this includes mint with its aggressive root system.